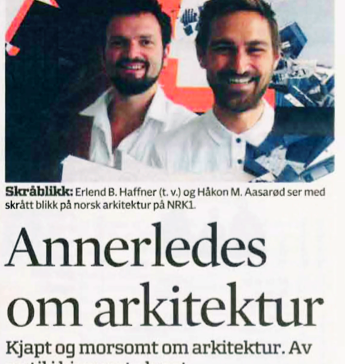 Fantastic norway / Håkon & Haffner | Great ratings / Great review! Great ratings / Great review! We just received a very nice review from Adressavisen (read it here) and great ratings from the second episode of our TV-Show “Håkon&Haffner”. 35% of all people watching TV in Norway this evening, were watching our program! That’s wonderful. We are very happy you guys didn’t choose Discovery or even worse: Tv2.